Saturday's chess picture challenge caused some problems. 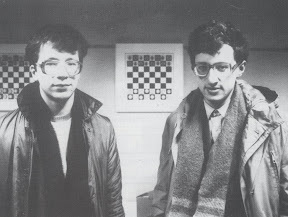 Most of you spotted Boris Gelfand (on the right) without too much problem, but the youngster on the left was harder to identify. It's not Gata Kamsky, as many of you thought, nor Dolmatov or Timoschenko, but is in fact Alexei Dreev, who went on to face Anand in a candidates semi final match, and win strong tournaments such as Dos Hermanas in 2001. He peaked at 2705 in the FIDE list. Gelfand, of course, is still involved in the current candidates series. Only two of you managed to get Dreev. Congratulations to Philippe Dornbusch who got it straightaway (including the venue!) and to Alberto Alvarez, who got it at the second attempt. Both are esteemed chess bloggers, Philippe writes Chess & Strategy, and Buenos Aires based Alberto is the lead blogger on Solo Ajedrez. I haven't had many suggestions so far for Sunday's match the chapter with the player puzzle, answers tomorrow.